Lucky Star Roulette is a simple number game. 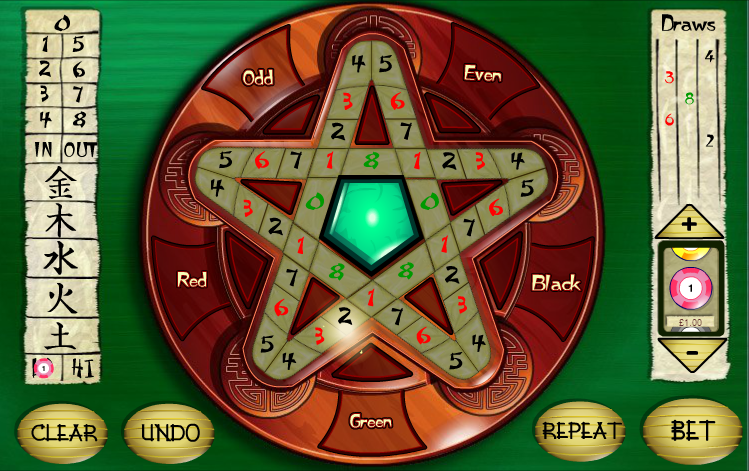 The board is a pentagram with 40 spots, numbered 0 to 8. A moving light travels around the pentagram and stops on a random number. The five spots at the corners of the internal pentagon are on intersections of two lines and thus have twice the probability each as any other spot not on an intersection. This game is found at some Internet casinos, especially those that cater to UK players. I do not know which software company is behind it. If you find out, please let me know. The game is played on a pentagram. The five lines of the pentagram are each divided into nine spots, numbered 0 to 8. Five of the spots are common to two lines, so the total number of spots is 9×5-5=40. A moving light will travel around the five lines of the pentagram, randomly stopping on one of the 40 spots. The five spots at the intersection of two lines are all numbered 1. Since the light travels through these intersection spots twice as frequently as other spots, they have twice the probability of winning as other numbers. The following table shows the bets available and what they pay. All wins are on a "for one" basis. As mentioned in the rules, the spots for the number 1 are on intersections and thus have twice the weighting as the other numbers. While there are 40 spots, five of them are double weighted, so the light passes through 45 spots in a revolution. The following list shows the bets available and the number of winning stops in a revolution. 0: There are 2 zeros on the sides of the center pentagram for 2 winning stops per revolution. 1: There are 5 ones on the corners of the center pentagram for 2×5=10 winning stops per revolution. 2, 3, 4, 5, 6, 7: There are 5 of each of these numbers, one on each point of the pentagram for 5 winning stops per revolution for each number. 8: There are 3 eights on the sides of the center pentagram for 3 winning stops per revolution. Green: The numbers 0 and 8 are colored green. Thus, the total winning stops is 2+3=5. Red: The numbers 1, 3, and 6 are colored red. Thus, the total winning stops is 10+5+5=20. Black: The numbers 2, 4, 5, and 7 are colored black. Thus, the total winning stops is 4×5=20. Lo: The numbers 1, 2, 3, and 4 are considered low. Thus, the total winning stops is 10+3×5=25. Hi: The numbers 5, 6, 7, and 8 are considered hi. Thus, the total winning stops is 3+3×5=18. Odd: The odd numbers are 1, 3, 5, and 7 for a total of 10+3×5=25 winning stops. Even: The even numbers are 2, 4, 6, and 8 for a total of 2+3×5=18 winning stops. Metal, Wood, Water, Fire, Soil: These are the five Chinese symbols. Each covers one line of the pentagram. Recall that two of the spots are on intersections so are double weighted. Thus, the total winning stops for each one is 2×2 + 7 = 11. The following table shows what each bet pays, the number of stops, probability of winning, and the return. The bets with the greatest return is a tie at 97.78% between black, red, and zero. I recommend you keep your bets confined to these three bets.